The rainbow colours and intricate shapes of objects in nature continue to amaze and delight me. These two very different examples came to my notice in September 2018. On 18th a small group of us were painting with watercolours at the Assynt Centre, under the guidance of Anne Nicoll. She and I went out onto the grass verges nearby (NC0922) to find some likely subjects. We returned with examples of the parrot waxcap fungus Hygrocybe psittacina. This exhibits a striking range of colours, from yellow to green, with parts tinged with pink and greenish-blue. Wendy Mackay of the Centre took some photographs on her mobile phone. 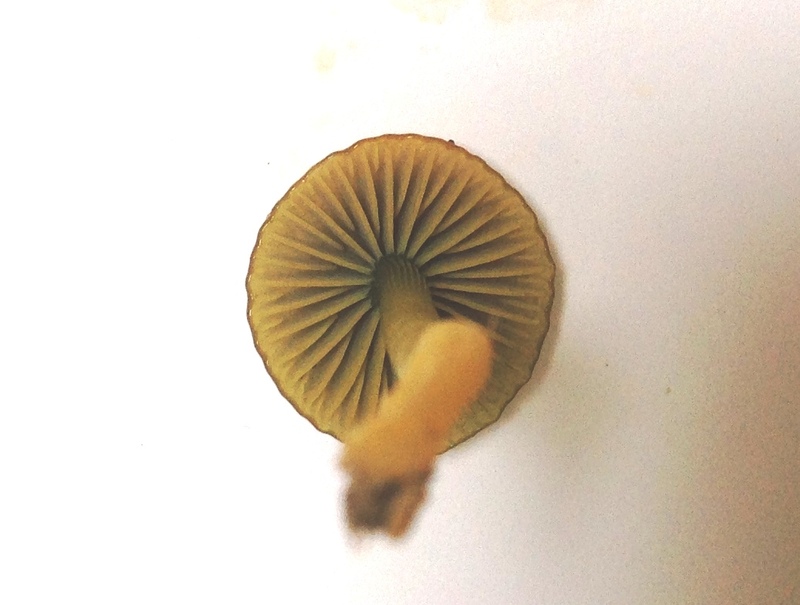 What intrigued me was the pattern of the gills on the underside of the cap, which are three different lengths. The primary gills stretch radially from their central attachment to the edge, and as they get further apart, secondary ones appear between them, about half the length. Finally there is a set of tertiary gills, quarter length, between all of those. In this way the total length of the spore-bearing parts of the fungal fruiting body has been maximised. Some ten days later, on 28th, I noticed a medium-sized but unfamiliar spider on a ceiling in my house at Nedd (NC1331). It was a member of the Linyphiidae, the so-called ‘money spiders’, of which some 300 species occur in the British Isles. Identifying them requires close inspection, under a low-power microscope, of the male palps or female epigynes. These are the complementary parts of a lock-and-key mechanism involved in sperm transfer. 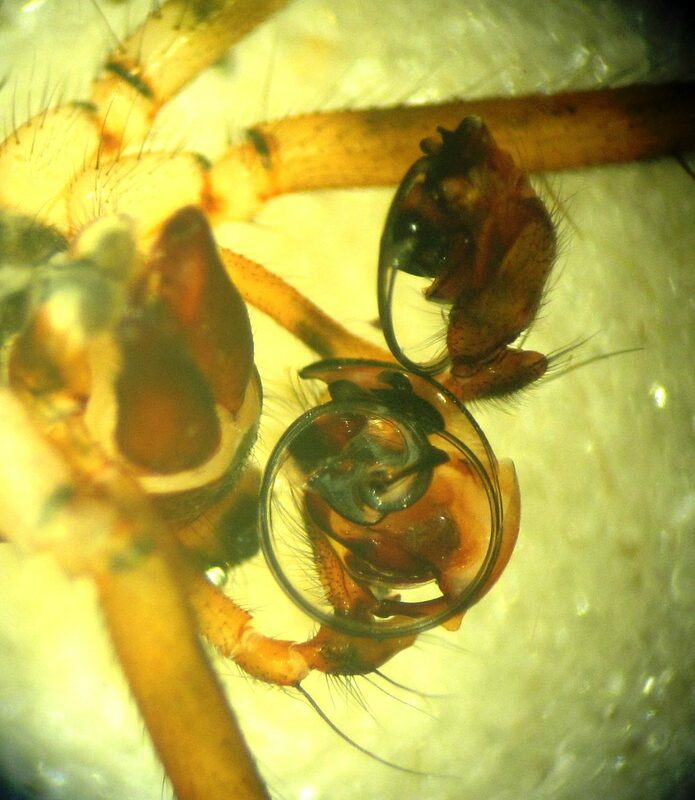 My specimen was a male, and its palps, at about 1.5mm across, were extraordinarily intricate. I had a rough idea where it came within the Linyphiidae. After leafing through the superb drawings in volume 2 of a three volume work by Michael Roberts, The Spiders of Great Britain and Ireland (1985), I was able to identify it as Labulla thoracica (regrettably, no English name). This is a widespread species of damp shady places in a variety of habitats. I would not have thought that my house quite qualified, but my garden certainly does, and male spiders do wander. There is a previous record for NC13, which includes Nedd, almost certainly one of mine. However, there are very few others from the north of Scotland, probably because no-one has looked. But that is true of much in nature.